Join the discussion on our forums! Come discuss Mad Frost Mage over in our dedicated Mad Frost Mage discussion topic. After you cast a spell, Freeze a random enemy. I'm having a lot of fun with demented frost caller and molten reflections in my Elsa deck. Let it go, let it go, I can't hold it back anymore! I dont know about high rank play, but I play this card in my mage deck and it is really useful and fun. Using a lot of low cost spells and paired with Gadgetzan auctioneer works really well. I once had this up with Antonidas against a pirate rougue and he gave up after 4 or 5 turns of gettin his face and minions burned and those who lived, freezed. I had like 6 fireballs in hand. Felt super happy. The only thing is the cost, it should be 3 probably. If that happens this card will get it's deserved respect. This card is underestimated. I found it pretty helpful against the pirate package because freezing your opponent's weapon for a turn or two is almost as good as destroying it. It also works wonders against Jade decks and sometimes Dragon decks because freezing a mid- to large-size minion is a huge deal. By the way, it never hits a frozen target; if all targets are frozen, it'll fizzle out without doing anything. You don't play all of your spells the same turn, like you might with Flamewaker. Speaking of Flamewaker, they both love the same spells, and there's no reason not to play both cards. I would caution against thinking it'll be good with Shatter, though. 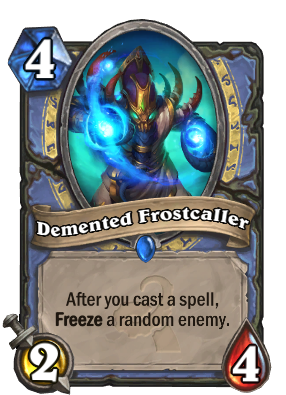 You need to cast a spell before Demented Frostcaller will activate and only then can you shatter their minion. Using three cards to kill one is not a very good deal and even then you depend on luck because this card's effect is random. This card is heavily underestimated. With enough cheap spells in your deck, this guy is reliable enough to buy you very precious time. Often whole turns. And he does so while you are bombarding your enemy. Also, this can freeze enemy face: weapons become huge tempo loss for your opponent. Add some more freeze synergy (Ice Lance, Shatter, Water Elemental, Cone of Cold), and it becomes a tempo card as much as Flamewaker or even stronger sometimes. All in all, with proper deck, this card is effective and fun. My previous analysis of this card was premature. With Shatter, this card will be insane. Add in Ice Lance, and you're looking at an entirely new Freeze Mage! I'm psyched! That's not for Freeze Mage that's for Freeze Mage. Get itt???? ?One deck burns you while freezing your board and the other freezes stuff and shatters it. the problem is even when you play this and the enemy has 1 card on the field , this may freeze the enemy champion. It may freeze the enemy champion, but it may not freeze characters which were already frozen. According to Robert Wing (if I understand the tweet correctly), it cannot freeze a character that is already frozen which does make this card better but I still don't have a fully grasped opinion of the card yet. I think lots of people are looking this card in very wrong way.What is amazing with this card is that once you cast cheap spells after playing this if your opponent doesn't have a minion with Charge he won't be able to trade.You can just keep casting spells and make this stick.Unless your opponent has a spell removel this will be a huge pain in the arse. Can it freeze a freezed character? A guy from Blizzard said it will try to freeze unfrozen people. Its on the main page of this website. Read it. In my opinion it should have 5 health just to be a little more robust and less vulnerable to spells like Swipe, Eviscerate or Wrath and Frostbolt plus hero power.